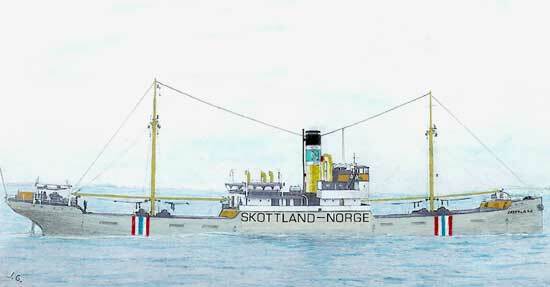 A painting of the SS Skottland made by Jan Goedhart of the Netherlands and shared with Dame Siri Lawson, web mistress of http://warsailors.com/singleships/skottland.html. The 2,117-ton steam ship Skottland was built as the Dutch ship Stad Zwolle by Meyer and Company’s Scheepsbouw Mij NV (shipbuilders) of Zalt-Bommel, in the Amsterdam area of the Netherlands. Her original owners from 1920 to 1939 were the Halcyon-Lijn NV or Rotterdam, which sold the ship to the Norwegian firm of F. N. Nordbø in Haugesund in 1939. Thus Haugesund was her home port, and her master was the Norwegian Captain Lauritz Jensen. The official owners were Dampsk.-A/S Skottland per warsailors.com. On April 25th Skottland arrived in Halifax and on the 29th she sailed from St. John, New Brunswick to Philadelphia. On the 12th of May she completed loading a full cargo of 1,575,467 feet of lumber and proceeded to New York Harbor, where she lay until the 14th of May. In New York the ship was to pick up a pilot for Sydney, in Canada, then proceed for London, UK, however as there is no record of a pilot being among the 24 men aboard the ship at the time of the subsequent attack, it must be assumed that a pilot or pilots simply boarded in New York and briefed Captain Jensen and his officers before leaving the ship. The 24 men were all Norwegians except for Norbin Folke, a Swedish engine room stoker, Sven A. Lindell, another stoker from Sweden, Philip Seils, a British mess-room “boy,” and Edward F. Simard, a Canadian ordinary seaman. Skottland proceeded through the sheltered Long Island Sound towards Nova Scotia (most reports agree that she was to proceed into the harbor in Halifax to await instructions to join a convoy to the UK). In the sound they obtained position fixes despite the fog by using the RDF, or Radio Direction Finder. Presumably the ship utilized the Cape Cod Canal and “nothing of Naval interest” occurred until the morning of Sunday the 17th of May. Around mid-day they were in a position roughly 60 miles west of the southeast coast of Nova Scotia and 170 nautical miles east-northeast of Boston. Captain Jensen and his men were defensively equipped with two sets of machine guns; one each on either side of the after boat deck, and one each on either wing of the navigating bridge. There was also a three-inch gun mounted on the stern of the ship. The vessel is described as a “three-island” type, with “houses” located aft, midships and forward, and also had 10 smoke floats of the cylindrical type, filled with oil. Also on board were Merchant Signals (MerSigs) and code books from the Royal Navy. Though operated by the Nortraship, or Norwegian Shipping and Trade Mission in New York, Skottland was chartered to the British War Ministry at the time. The morning of 17th May began calm and clear, with a breeze of less than 10 knots from the southeast. The ship steamed on a straight course of 82 degrees eastwards, without zig zagging, at nine knots. Around the middle of the morning the men were accompanied by the reassuring presence of a Canadian or RAF plane out on patrol. At around 11 am, after flying overhead several times, the plane flew off and Captain Jensen and the officers initiated an all-important lifeboat drill as well as gun practice. They left Folke Norbin at work in the engine room and three lookouts posted, one each on the bow, stern and bridge amidships. Twenty men were drilling and four were performing other work when at 11:40 am local time Second Mate Nils M. Ugstad saw “a break in waves with a flash of white water that lasted 2 seconds.” He immediately called First Officer Konrad Naess over to corroborate the sighting, which was roughly 200 yards or 600 feet off the ship’s port side. Other sailors saw a brief splash which they dismissed as a fish of some sort. They had just finished firing practice shots from the 3-inch gun aft. Then – at either 11:40 or 12:10 depending on the time zone – there was a “terrific explosion and everything was covered with steam, lumber flew in all directions.” Skottland has been hit by two torpedoes fired by the nearby German submarine U-588 under Victor Vogel. One struck between the third and fourth holds, near the after mast, and the other is believed to have penetrated the fire room on the port side, killing the stoker working there, and gone right through the space, bulging the bulkhead on the starboard side to the width of a meter. The ship rolled to port, submerging and destroying all lifeboats and rafts on that side, and spilling vast quantities of dangerous timber into the ocean, so quickly that the men had to push the starboard lifeboats over that side of the ship and along the sides of the nearly horizontal ship to reach the water. They did the same with rafts. Captain Jensen was on the starboard bridge wing on impact – he ensured the secret codes would be destroyed, grabbed other important papers from his cabin, and ran to help launch the boat. A third engineer, Olav Berg, was below long enough to see steam fill the engine room, the power cut off, and the engines stop before he raced for the deck. Doubtlessly if they were not almost all on deck at the time many more would have perished, since within between three and five minutes the Skottland appeared to break in two and roll over on its port side and sink. There had been no time to issue a Mayday via the radio, or to swing the guns and fire at the attacking U-boat, as none of the men ever saw it during or after the attack. Captain Jensen and 22 of his men in found themselves in two life rafts and a life boat. He ordered them to look around the extensive wreckage for the missing fireman, in vain. During their search and in the last moments that the ship teetered at a 90-degree angle, they observed a “prominent bulge, approximately a meter and a half in diameter” below the bridge on the starboard side, opposite which the torpedo had struck. Then after roughly half an hour of searching for Norbin, a friendly airplane returned. After circling the men and ascertaining that their ship had been sunk and they were at the mercy of the elements, the pilot then flew off. About seven minute’s steaming away the pilot encountered the Canadian lobster boat named O. K. Service IV, under the command of Captain S. E. Himmelman. At 1:15 pm local time the fishermen were approached by the plane, which repeatedly flashed red lights, using a method of signaling with which the mystified fishermen were unfamiliar. Since signals failed to elicit the desired response, the pilot then opened fire with a machine gun off the bow of the O. K. Service IV, which caught their attention. The pilot then waved to them and they followed his plane for seven minutes until they could see the Skottland’s lifeboat and rafts. Although the sea was covered for nearly a mile in timber and other wreckage, Captain Himmelman and his men managed to pull all 23 survivors aboard their craft by 1:30 pm. At that time they were just under 60 miles from Seal Island Light, Nova Scotia. Himmelman noted that two of the men were badly injured and four lightly. For whatever reason, they decided to head to Boston, Massachusetts, where they reached Pier 1 in South Boston. The pilot circled overhead until all the men were landed aboard the Canadian vessel, then signaled again and flew off. During the voyage to Boston everyone who could kept a very sharp lookout. The O. K. Service IV made impressive time, as they are reported to have docked the same day, Sunday the 17th (another report says they arrived the following morning, which is more likely). In Boston US Navy Lieutenant P. G. Tague and Ensign P. H. Skuse, US Naval Reserve interviewed Captains Jensen, Himmelman, and other witnesses. Two ambulances from the Medical Corps arrived to take of six of the men, who were brought to the Boston Navy Yard Annex, across the harbor in Chelsea Naval Hospital. Second Engineer Harold Ludvigsen and Second Mate Nils Ugstad had contusions, abrasions and Ugstad had a fractured left wrist. Fellow Norwegians Karl Myrsseth and Nils F. Olsen had fractured skulls and a leg respectively. British sailor Philip Seils fractured his left shoulder and Canadian Edward Simard fractured his left ankle. Whereas Ugstad and Ludvigsen returned to their crew mates and were “turned over” to the Norwegian Consul in Boston, the other four remained in hospital a few more days. Before joining other ships the men were taken to New York, where senior officers were interviewed again by US Navy officials, on the 27th of May, per Siri Lawson’s warsailors.com.